Cougar values are: RESPECT, PARTICIPATION, TEAM and GROWTH. We are a community-based organisation providing our local youth with the support and facilities to learn, play and enjoy football. Our history dates back to 1952 and we play in the Northern Football League. Our club song, “Good Old Northcote Forever“, is sung to the tune of the Collingwood anthem. 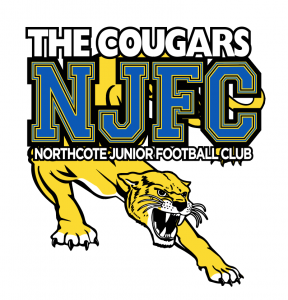 We are affiliated with both Northcote AusKick and Northcote Park Football Club. As with all community-based amateur sports clubs, we are an organisation managed and run by dedicated volunteers working within a structure governed by our club constitution. The management committee is elected by members. One parent becomes a member when their child joins the club; additional social memberships are also available. We have the top level of Australian Football National Risk Protection Programme insurance policy from Jardine Lloyd Thompson.